The Korean consumer electronics maker has added an NFC-enabled refrigerator, washing machine, oven and vacuum cleaner to its lineup of NFC phones, smart TVs, media hub and speakers. 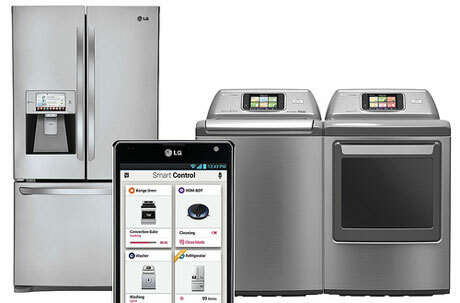 Consumer electronics maker LG has added an NFC-enabled refrigerator, washing machine, oven and vacuum cleaner to the list of NFC home electronics devices it launched at the CES show in Las Vegas last week. The new smart appliances all use LG’s Smart Control technology, which now includes NFC, allowing users to pair their smartphones with their white goods via an NFC Tag-on touch point on the appliance. They can then subsequently manage the machines remotely over a WiFi connection. NFC is used for pairing and to hand over to a optional WiFi connection, so that data may be exchanged between the phone and the appliance over a greater distance. Users can also program actions on their phone and then transfer the commands to the appliance via NFC. The technology is also used in a Smart Diagnosis feature that alerts the user to technical issues with an appliance. The company has also introduced a pocket-sized portable photo printer that uses NFC to pair with a camera. The LG Pocket Photo can be used with Android phones and uses Zink “zero ink” photo paper to print 2-inch by 3-inch snaps on demand. The device retails in South Korea at around £105/US$170.